Eliminate the mop bucket, improve results, enhance safety! 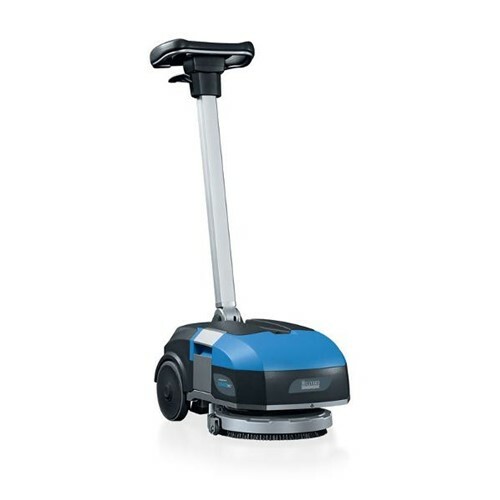 The Hillyard Trident XM13SC is a compact, lithium-ion powered micro-scrubber that scrubs and dries in a single pass. Scrubs and dries in a single pass. The floor is dry and safe to walk on in just a few seconds, preventing the risk of dangerous slip/fall accidents. Parabolic Squeegee Scrub and Dry In Any Direction - The innovative rotary head is equipped with a parabolic squeegee. The squeegee continuously follows the direction of the machine, delivering perfect scrubbing and drying results in any direction. Clean Everywhere - Perfect for tight spaces. Clean under chairs, tables, shelving units and more. Offset brush enables total cleaning - all the way to the wall! Always Ready To Use - No self-discharge. It is always ready when you need it. No memory effect, you can recharge the battery whenever you want. Fast Charge - You can use the XM13SC several times in a single day. Low Battery Costs - High discharge/charge cycle lifespan. Handy Battery Charger - Lets you recharge anywhere, without wasting time. The controls on the steering wheel are simple, intuitive, and easy to use for an inexperienced operator, ensuring total control over the machine and the cleaning process. Cleaning settings are already pre-configured when using the automatic scrubbing function. Simply press the AUTO button to start. An engineered aluminium uni-body chassis is sturdy and light weight resulting in less strain on the operator during use and transport. When not in use, the machine's compact dimensions mean that it can be stored anywhere, even in the smallest closet. The steering wheel height and tilt are adjustable to suit the stature of the operator and reduce back fatigue.